I'm coming up to Toronto on Thursday this week [April 3rd] to speak to the friends of the Broadcast Research Council about the FUTURE of media and brands and communication and that. It's at the Spoke Club - if you fancy coming you can get tickets by emailing Taylor. 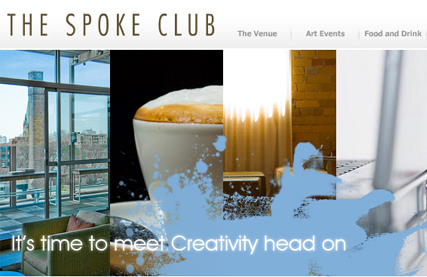 I intend to meet Creativity head on. I'm staying through Friday so I can explore 'Ronto a bit - so if you have any suggestions of things I should do or fancy grabbing a drink, shout. My mate Allan found his way into the vault, got hold of the footage from Trucks and has begun the Truckmix, with this topical reference to Heathrow Terminal 5's baggage issues. The sequel to Cadbury's Gorilla spot launched today. Trucks is another slice of surreal madness, with a truly awesome soundtrack choice, that's delightful [although it could use a better denouement] and will trigger innumerable arguments as to whether it's as good as the original. The film launches alongside the launch of Glass and a Half Full Productions website and it's just grand. The lovely people at digital shop HyperHappen have incorporated a bunch of features that capitalise on many of things TIGS is obsessed with. The interface is an intuitive 3D chocolate factory that hosts the Gorilla; the studio it was filmed in; some of the top Gorilla remixes; a teaser of a build-your-own truck application; an ARG-lite that opens up a password protected vault that holds downloadable clips of Trucks for easy recombinance; and a few films that show the provence of Dairy Milk and its fairly traded supply chain. Adobe has just launched Photoshop Express, a free cut-down online version of Photoshop. Software as a service, or what we used to call application service provision, comes to the web's favourite image manipulator. Comic book superheroes may owe their origins to New York, despite Superman being invented in Ohio, since pretty much all modern comic superhero started out based in New York [or poorly disguised versions thereof, like Gotham City]. 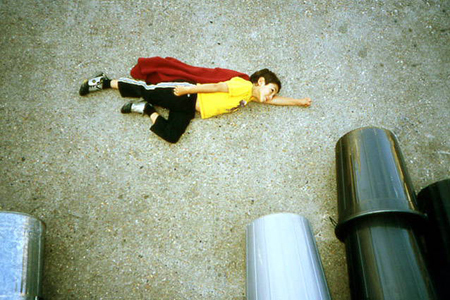 This really simple photographic device expresses the artifice and the naivete of children playing and that. I imagine it will get turned into an ad soon enough. Just a very quick reminder about drinks tonight at Sweet and Vicious - details a couple of posts below. 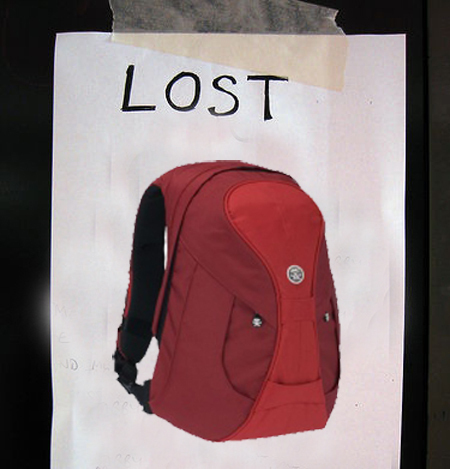 I seem to have lost my lovely Crumpler bag somewhere in New York - anyone seen it? I worry that its out there somewhere, lonely and confused, with nothing by fragments of my clothing to keep its insides warm. Admittedly, it's a long shot - but wouldn't it be awesome if it found its way home thanks to the socialmediadistributedinterweb? I can't wait until they come equipped with GPS trackers. Since a bunch of people are coming into town for the PSFK conference on March 27th, we thought this might be an excellent reason to have some kind of likeminded beersphere type thing. So, in the spirit of hanging out with nice people and becoming intoxicated, Noah and I will be drinking on March 26th and invite you all to join us - regardless of whether you are coming to PSFK or not. When: Wednesday 26th March 7pm until drunk. Come all, drink and be merry, for spring is springing and trends are trending. I just stumbled across this - even though its been running for about a year it doesn't seem to have generated much noise - most of the blog mentions I found about this were MS developer blogs. Which is a shame - because it is a GOOD THING. 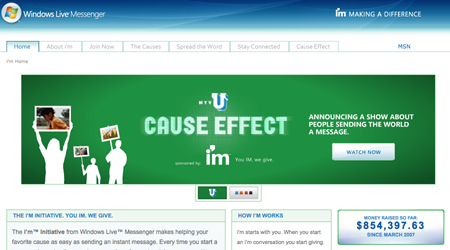 The I'M Initiative from Microsoft donates a percentage of the advertising revenues it brings in from Live Messenger conversations to social cause organisations. You sign up, choose a cause, and then everytime you start an IM conversation, some money goes to your cause. Thus far the activity has raised >$850k. Change the world or go home indeed. One of the blogs that has picked up on this suggested this was hypocrisy - that it locks users into using bug ridden software to give pennies to charity. And this is something I hear a lot - cynicism about brands doing socially conscious promotions to build their business on the back of 'consumer' desire to do good. Of course they are. They are businesses. All they care about is money. That's the function of business - to generate profits. It doesn't matter whether or not you think Milton Friedman was right. That's the way businesses operate - their responsibility is to deliver profit for their shareholders. The only way I've managed to engage senior clients in a corporate social responsibility discussion is by positioning it as a strategic business function that will deliver long term shareholder value. In marketing terms it was a strategic point of differentiation and added value - its increasingly becoming a competitive necessity - because we, as a consumer base, are more concerned and willing to move our money to reflect that. To a degree. As I mentioned before, most ethical consumerism is founded on the idea of Low Impact Ethics - if we all really wanted to change everything we'd, well, change everything. Some brands that have sprung up since the mass awakening of social consciousness have socially responsible profitability at their core but the mega brands are relics or a less conscious age - they are dinosaurs - perfectly evolved to extract profits from, not help, the world. Our role is to convince these brands that the best way to make money in the world today is to cater to the growing consumer need for emotional added value in purchases - be it social or ecological - that is reflected in the the brands they buy and the premium they are willing to pay. Companies that do good need to make more money - then more companies will do good.